His follow up question on his post was, "What do you all think about this article? If true, what does it mean for our school-based 20% projects?" "Regardless of what Google ends up doing with their 20% time, I still think this concept should be built into the classroom. Google is mostly about production. School is mostly about learning. Allowing students to inquire and explore an independent study or project, with complete autonomy, is invaluable to me. Students don't get enough time to participate in meaningful learning opportunities on topics of their choice. To be honest, I wish schools implemented a "100% time" initiative where we wouldn't have to worry about mandated standards, assessments, and accountability. Where true inquiry would lead the learning for each day, and teachers would encourage, support and facilitate students in their journey." It turns out that "Google engineers insist 20% time is not dead—it’s just turned into 120% time". 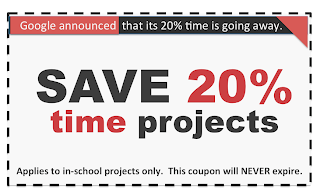 Unfortunately there isn't enough time in the school day to implement a "120% time" initiative, unless you count extracurricular clubs and activities after school. 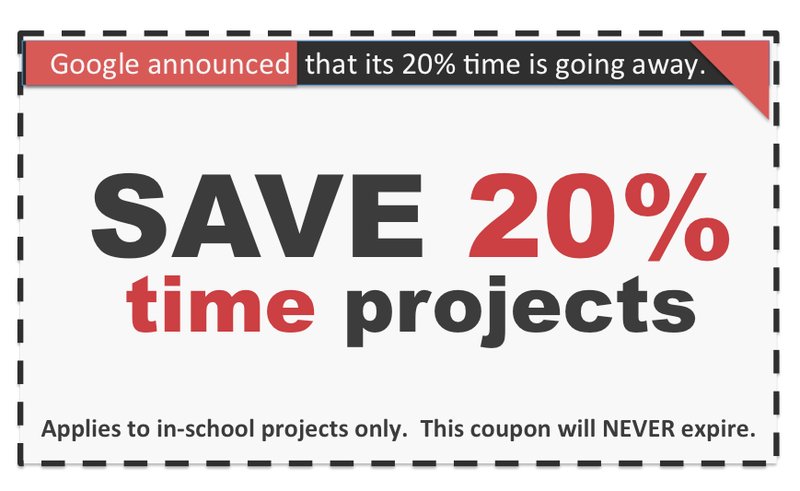 So again, what does this mean for our school-based "20% time" projects? If you have incorporated "20% time" into your classroom, or have experience with 20% time with regard to learning in school, please share your thoughts and reactions to Google's announcement.